BCS the leading Nutanix Gold partner in Dubai. Its hyper-converged compute, virtualization and storage platform is the foundation for the world’s advanced software-defined datacentres. This simple, intelligent datacentre infrastructure delivers cloud-like economics and agility. Region’s trusted “True” Value-Added-Reseller(VAR), Nutanix and BCS deliver an end-to-end solution for deploying and securing next-generation data centers. BCS is one of the fastest growing IT resellers in the Middle East. BCS the region’s trusted Value Added Reseller. We are one of the largest and fastest growing IT resellers in the Middle East. With strong on-the-ground presence across the region.BCS will sell, install and support Nutanix products through its extensive network of Channel Partners to enterprise and government customers in the Middle East. IT department can now focus on the applications and services that power their businesses while achieving substantial cost savings. Together with BCS we are providing our customers with a simple but elegant data center solution, that simply works and requires no complex legacy infrastructure. As a leader in enterprise cloud computing and hyper-converged infrastructure (HCI) solution, we are confident that our customers will enjoy the benefits such as faster time to value, lower total cost of ownership, and higher return on investment. 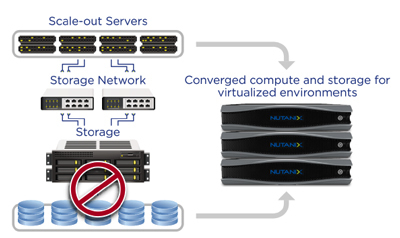 Nutanix hyperconverged simplifies infrastructure purchase,deployment,management and support. Nutanix hyper-converged: server and storage integrated in a single server. Hyper-convergence reduces power, space and eliminates storage network complexity. Nutanix uniquely built using web-scale technologies and architecture originated in large internet and cloud companies, such as Google, Facebook and Amazon.